This auction was won by p***0. Courtesy of Rutherford’s Punting, this auction is for a wonderful and truly Romantic Punting Experience for 2 on the River Cam in the beautiful city of Cambridge in Eastern England. Experience includes: Punt, Guide Chauffeur and a half bottle of Champagne for two. Romantic Punting Experience for 2 is valued at approximately £142 GBP*. Please note all additional purchases including meals, drinks, spa treatments, excursions etc. must be paid for by the winner separately. Auction experience dates: to be booked by 31 March 2019 and taken before 31 December 2019, excluding bookings on 25 December, subject to availability and river conditions permitting. Experiences can be taken from 9am till dusk all year round. 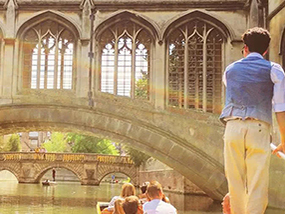 Courtesy of Rutherford’s Punting, experience the quintessential activity for Cambridge lovers: a Romantic Punting Tour for two in Cambridge. The tour guide will be waiting to whisk you on Cambridge’s most unique experience, exploring the city’s history and grandeur together. Each accredited tour takes 50 minutes, and your boat will be dressed with cushions, lumbar supports and blankets with beautiful petals in the boat to impress. Your guide and your boat will be ready to board at the time you choose. There will also be a half bottle of award-winning chilled Champagne and two flutes ready for you to enjoy. This tour is ideal for anniversaries and couples looking for a special afternoon. Please note that both guests must be over 18, as you will be greeted with a chilled half bottle of prestigious Champagne and two flutes for your tour. Guests are also welcome to bring along something to eat on your tour. The winner and their guest can check in at the desk on the Quayside for bookings during the week (Monday to Friday) or head straight to the Jesus Green Moorings, a short walk along the boardwalk from Quayside, for weekend bookings. The boats and employees dress according to the weather on the day. On warm days your guide will wear a waistcoat or shirt and perhaps even braces. In cooler months of the year, your guide will wear a professional coat and your boat will also include extra blankets with umbrellas in case the weather changes as well as hot water bottles. Luxury Travel Diary terms and conditions apply. *This auction item is valued at approximately £142 GBP by Rutherford’s Punting – please note this valuation is the list price provided to Luxury Travel Diary by the Auction Prize Provider and should be used as a guide only as cheaper discounted rates may be available. No cash alternative is available. This auction item excludes flights, accommodation and transport – you will need to arrange your own flights / accommodation / transportation to and from your home to your Rutherford’s Punting Experience collection point at Quayside, Cambridge, CB5 8AB, England, UK to coincide with your booking. Your stay is subject to availability, must be booked by 31 March 2019 and taken before 31 December 2019, excluding bookings on 25 December, subject to availability and river conditions permitting. Experiences can be taken from 9am till dusk all year round. Please note any associated taxes / resort fees / entrance fees etc. and all additional purchases will be collected from the winner by the relevant property at the time of booking your stay or on departure and will not be deducted from the amount bid for the item. Please note Rutherford’s Punting terms and conditions also apply to this auction and these can be read in full here: rutherfordspunting.com/terms/. Winners must pay for their auction item in full via PayPal within 48 hours of the auction end. The full Terms of our auctions can be found here. To the fullest extent permitted by law, Luxury Travel Diary will not be liable for any loss or damage arising out of the winners’ use or enjoyment of the prize; and the winner acknowledges that Luxury Travel Diary accepts no responsibility whether directly or indirectly for any claims whatsoever arising in respect of the prizes provided by third party providers or sponsors.